Young Jump Rope for Heart Participants. Our community is very involved as evidenced by our active School Council and Parent Volunteers. Parents offer students Healthy Snacks, sponsored by Childhood Enfance, and Scholastic Book Fairs. Parents are welcome members of our school community, as seen by their involvement in their children’s classes and countless hours of volunteering in many aspects of school operations. 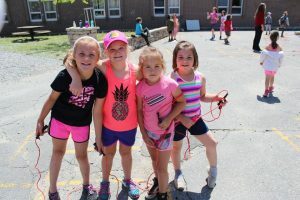 As part of the “Pay It Forward” initiative, Redwood Acres Public School staff and students do ordinary good deeds, that lead to extraordinary good things. We participate in the Terry Fox Run, Nickels for the North, Christmas Food Drive, Jump Rope in addition to supporting many other community organizations and initiatives. YMCA Licensed Child Care Services provides before and after school care at Redwood Acres. For more information about their programs please contact Melissa at the YMCA at 705.673.9136 ext. 2137. Volunteers… the heart of our school. If you have some time that you can donate to our school, your assistance is greatly appreciated by staff and students. Volunteer opportunities at Redwood are almost limitless. Whether it’s a one-time event, like supervising a class trip, or an ongoing commitment, like coaching a school basketball team, we have a role for just about everyone. As per the Rainbow District School Board policy, all volunteers who work with children must have a recent police check. Please don’t let this requirement deter you. Ensuring your children’s safety is always a priority. Please contact your child’s teacher, the main office or the principal if you would like to volunteer. Board information on Community Use of Schools.